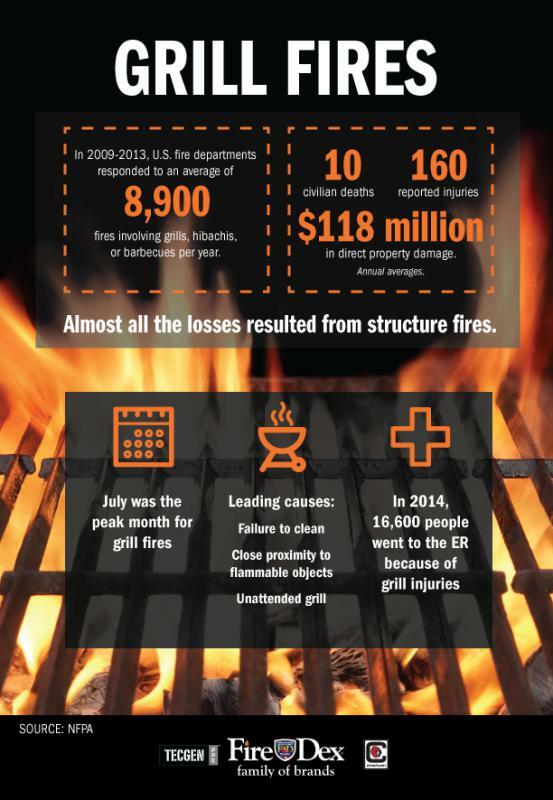 - Place grills away from the home, at least 10 feet from any structure or flammable materials. Be sure to keep grills away from deck railings, out from under eaves and awnings, and be mindful of overhanging branches. - Keep children and pets at least three feet away from the grill area. - Keep your grill clean by removing grease or fat buildup from grills and trays in grills. - Never leave grill unattended. Maintain a three-feet no-kid-zone around the grill. - Always make sure the gas grill lid is open before lighting. - Be sure to turn off the gas after cooking. - Check the gas tank hose for leaks before using. Apply a light soap and water solution to the hose, a leak in the hose will release bubbles. If your grill has a leak, turn off both the grill and the gas tank. - If the leak stops, do not use grill and call to have it serviced by a professional. If it does not stop, call the fire department. - If you smell gas while cooking, immediately get away from the grill and call the fire department. Do not move the grill.